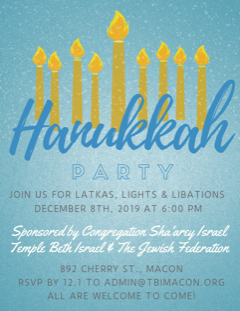 Join us for Latkas, Lights and Libations December 8th at 6:00 PM! Please RSVP to admin@tbimacon.org by 12/1. Thursday morning minyan at 7:00 a.m.
Friday Evening Shabbat services at 6:15 p.m.
Saturday Shabbat services at 9:30 a.m.
Friday: 9:00 a.m. - 3:30 p.m. Lunch: 1:00 - 2:00 p.m. Copyright © 2019 Congregation Sha'arey Israel. Web hosting provided by the United Synagogue of Conservative Judaism.